Our family loves this classic French dessert, Palmier very much. Every time I bake this dessert, they would be gone very quickly. My daughter is a big fan of pastry and loves every dessert that made of it. Due to its simplicity, this Palmier goes really well with other desserts. Just imagine how wonderful it would be when you chat with your family or an old friend after dinner over a cup of coffee or tea, tasting some crisp palmier cookies. Preheat oven at 200C (392F) or 180C (356F) fan. Sift and sprinkle about half of the sugar over your workstation. Roll out the puff pastry. Lightly brush melted butter on pastry. Sprinkle another half of the sugar over the pastry. 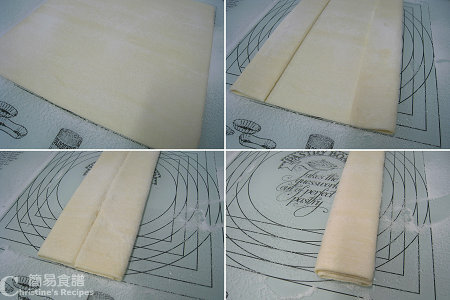 Transfer pastry on your workstation carefully. 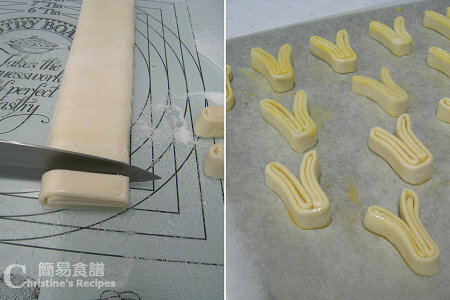 Cut pastry into strips about 1.25cm (1/2 inch) in thickness. Lightly brush melted butter onto each side. Pinch and press the sides of the two rolls together to ensure that they don't unroll during baking. Place on baking tray lined with baking paper (as picture shown). Leave about 5 cm (2 inches) between each because they will increase in size after baking. Bake in batches if needed. Set the tray in the middle of the oven. Recommend to use fan-forced mode if your oven has this function since the colour of the palmiers would be more even and better looking. Bake for about 20-30 minutes, turning once at the last 10 minutes, until the sugar has caramelized and golden brown. Allow them to cool on a rack for 10 minutes. Enjoy! Use vanilla sugar instead of caster sugar with a kick if you like to add more fragrance. These palmiers were made by my lovely daughter last night, following my recipe here. Aren’t they lovely? I always wonder what these are called! I enjoy eating these too, sounds really simple! Fantastic! God, it reminds me my childhood in France when I used to eat a lot of 'Palmier'. Congrats for the recipe, I love it! This is definitely my favourite! It goes well with a cup of coffee. Luv it! These are absolutely beautiful. What a great recipes. Thank you so SO much for sharing. I will make these for my babies. Its simplicity is what I like. My daughter also added some cinnamon into some of these palmiers...Smells even better. Even we're not from France like this Palmier very much. These little cookies have some magic ...Fantastic! You're welcome. Hope you'll enjoy this dessert. Thumbs up for Palmiers ! Cheers ! Thank you for posting this yummy recipe! I just found out about your blog and I LOVE all of your recipes. I tried making this recipe today but the puff pastry was too soft and was hard to handle. Am I suppose to use it right out of the freezer or am I suppose to defrost it first (as indicated on the package)? Just follow the instructions of the package to defrost the pastry first. Yet don't wait until the pastry is too soft cos it's very hard to control. 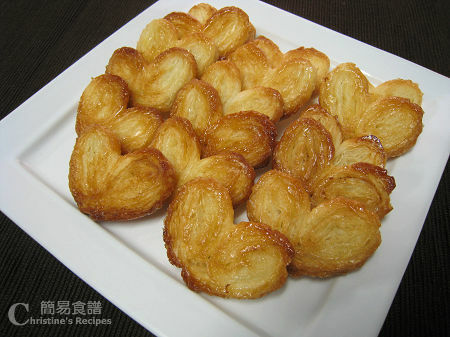 This palmiers will make an awesome party item. So easy to prepare...didn't know that. Thanks for showing. delicious! i buy these from trade joe all the time. thanks for the recipe, i'm going to make my own from now on. Thank you for sharing your recipe. I love Palmier and every time I'm back in Paris I have to have them very often:) Also didn't know they were so easy to make, might just give it a go. Everytime I made this dessert and brought to party, everyone loved it. Then you can have this dessert whenever you want. Give it a go. It won't let anyone down, for sure. Where do you live? I bought the pastry board at a nearby plaza, called Sunnybank plaza. Wonderful recipe! 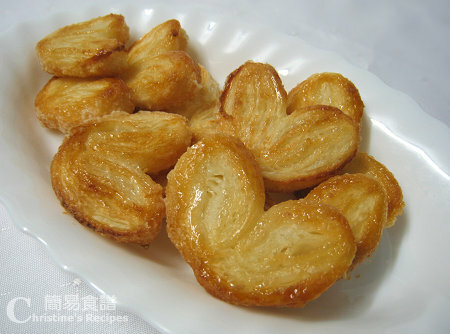 I tried baking this and yield around 15 pcs. My 2 daughters can't stop eating! That's great! My daughter also likes it very much. She baked twice by herself. I love your recipes! Here in the US, we call these Palmier's cookies, Butterflies or in cantonese "wu deep beng"
Do you mean use one package of phyllo? Your phyllo looks thicker. There are usually 2 packages of phyllo in a box, and each package has 20-25 sheets. I tried doing the recipe by one sheet, but they come out too brittle. I'll try the next batch with one package. I'll let you know how they turn out. I used puff pastry that's different from phyllo, not as brittle as phyllo. Made two batches today and they were a big hit with my family - thanks for sharing! Thanks for the lovely recipe!! How long can we keep them after baking? After cooled completely, you can store them in an air-tight container for two to three weeks. Your daughter's palmiers look so beautiful. So simple to make yet so yummy. Thanks for sharing. this looks amazing, im off to woolies to buy some puff pastry now! Can you use regular granulated sugar instead? And if I were to put in cinnimon, how much would I add? Sure, you can use regular sugar. Simply sprinkle cinnamon on top of sugar as much as you like.